Changes in the distribution of ambient temperature, due to climate change or otherwise, will likely have a negative effect on public health. Characterizing the relationship between temperature and mortality is a key aspect of the larger problem of understanding the health effect of climate change. In this article, a flexible class of distributed lag models are used to analyze the effects of heat on mortality in four major metropolitan areas in the U.S. (Chicago, Dallas, Los Angeles, and New York). Specifically, the proposed methodology uses Gaussian processes to construct a prior model for the distributed lag function. Gaussian processes are adequately flexible to capture a wide variety of distributed lag functions while ensuring smoothness properties of process realizations. The proposed framework also allows for probabilistic inference of the maximum lag. 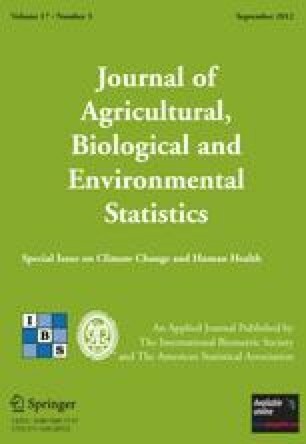 Applying the proposed methodology revealed that mortality displacement (or, harvesting) was present for most age groups and cities analyzed suggesting that heat advanced death in some individuals. Additionally, the estimated shape of the DL functions gave evidence that highly variable temperatures pose a threat to public health. This article has supplementary material online. Supplementary materials for this article are available at 10.1007/s13253-012-0097-7.